Camp Abilities Saratoga is a one week educational sports/recreation camp for children and teens who are blind, visually impaired and deaf blind. The next camp session is scheduled for the week of August 4, 2019. The camp will be held on the campus of Skidmore College located in Saratoga Springs, New York. Morning sessions at the camp will feature sports such as Beep Baseball, Swimming, Goal Ball, Track, and Tandem Biking using Skidmore College’s athletic facilities. A standup paddle board program offered by Southern Tier Stand Up Paddle Corp.
An Equestrian program conducted by Rolling Oaks Stable at their facility in Gansevoort, NY. An Ice Skating program at Saratoga’s Weibel Rink held by the Saratoga Ice Stars. 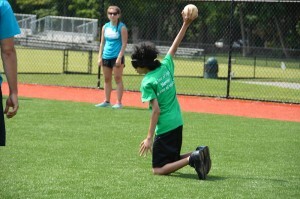 The Camp Abilities Saratoga staff includes Adapted Physical Education specialists and is set up to provide a one-on-one instructional situation for each person. Evening events also include a barbeque in the Saratoga Spa State Park, a dance, bowling, and a talent show. The camp supports an enrollment of 26 children.